This handsome fella is from our Maine Mountain Litter. His name is from the highest peak in Maine and the northern end of the Appalachain Trail. It is Penebscot Native for "The Great One.' Mount Katahdin stands tall and alone in the northern heart of Maine. Its barren summit is a vast and rocky tundra known to have some of the worst weather in the world which has been the origins of much of the folklore of Maine's great North Woods. This will be Katahdin's second season, but if he is anything like his mother and father I have no doubt he'll be able to step right in and contribute this winter. Katahdin fuels his endless energy with his endless appetite. he also sports a beautiful thick coat which will make our cold winters that much more cozy! Huge thanks to Monica Dicus for sponsoring Katahdin for the 2018/19 race season! This wacky little fellow is from the 'Wild Boy's litter theme. Riot may only be a yearling but he certainly has his mother's energy! He has a huge drive to go forward which is so important at his age. We look forward to watching Riot develop this season and work his way into the main team. He definitely has some strong leadership potential! SPONSOR RIOT FOR THE 2018/19 RACE SEASON! This little girl blows my mind. She was the runt of the litter and still to this day her siblings boss her around on play walks, but she is a true inspiration for us all. When put on the team, all of that is set aside because Rubi, well she is THE lead dog! I have never seen such a passive little girl dominate the leader position quite like her. Rubi's intensity, pure leadership, and determination were key contributors to our success on the race trail last year. She is a true independent thinker and goes by her own beat of the drum. If any of you ever get to meet her mother Teva, well, Rubi’s confidence at lead and princess qualities in the kennel are a near reincarnation! Expect Rubi to lead team Tukaway in every way this season! Thanks to long time sponsors Terry and Connie Eddy AND of course Zuni from Ontario, Canada, for sponsoring Rubicon for the 2018/19 race season! This little girl is ready to rock! This is one special dog! In the kennel, she gives sweet roo roo's and always greets everyone with a smile, but when its time to work, she is all business! Sahara is very versatile in the team, but When the going gets tough, expect this rugged girl to take the helm at lead and pull us through. She was a key contributor this past season and stepped up when it was needed. By definition, she is a true leader, and holds out the team with a confidence that rivals George Washington crossing the Delaware! 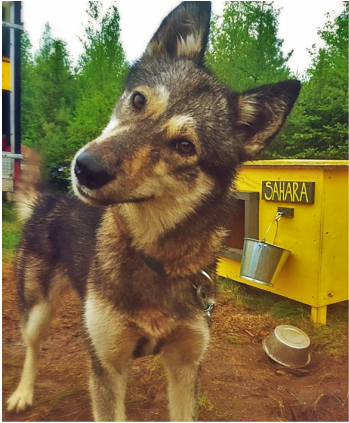 ​Thanks to longtime sponsors Terry and Connie Eddy, AND of course Zuni from Ontario, Canada for sponsoring Sahara for the 2018/19 race season! This girl is ready to lead the way! This little girl is simply perfect! She reminds me of her father Wizard who is known for always finishing with a smile, no matter the challenge! Cherokee’s toughness, perseverance, and easy going attitude helped her finish all races last season and at times spent time leading our team down the trail. Cherokee is known for her BIG smile and energetic attitude towards EVERYTHING! I might be biased, but this girl is a rising star in the sport! Thanks to Jerry Zappa from Wisconsin for continuing his sponsorship of Cherokee for the 2018/19 Race Season! We are expecting big things out of this BIG fella for the upcoming season! This gentle giant lounges around the kennel and cabin and patiently watches our every move. But under his relaxed demeanor awaits his brute strength. When this boy pulls, HE PULLS! This winter, plan on seeing Willie step up and become a key member of the team as he continues to mature, and I fully expect him in the near future to step into his father Wizard’s booties and live up to his legacy on the trail! Thanks to my Aunt Susan and Uncle Marsh for sponsoring Willie for the 2018/19 Race Season! Kibby is from our Maine Mountain Litter theme. She is named after a tall peak up on the remote Canadian/Maine border. Although she is built short and stalky I am pretty sure she will end up working with the heart equal to a big mountain! I expect big things out of this lady and she certainly shows signs of leadership like her momma, but we'll have to wait and see. This will be Kibby's second season and after last year's performance, I expect big things! Sponsor Kibby for the 2018/19 Race Season! 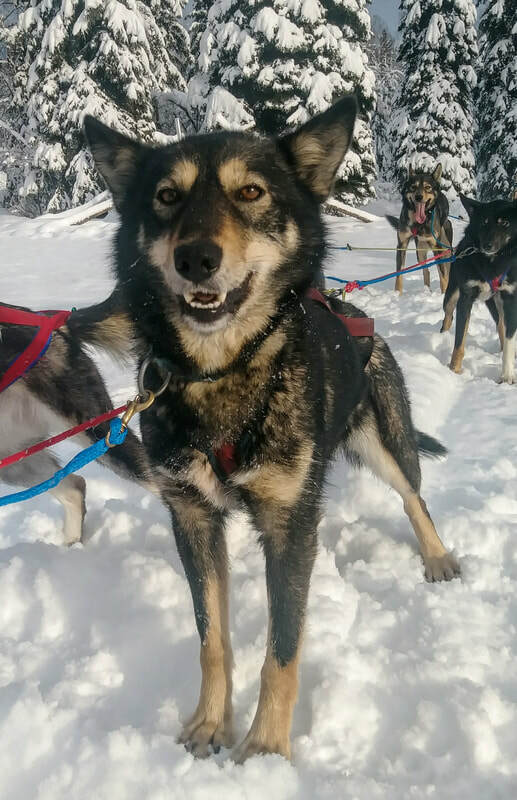 If there ever was a saying that could perfectly describe a sled dog, Laredo’s would be, “all brawns and no brain!” This guy is pure muscle and intensity that matches his incredibly strong appetite for food! Last season, Laredo finished every race in top form. He has shown that he is one tough dog! This season, expect Laredo to be a key member in our team’s success and watch closely, you might see this guy step into the leadership role. I think he’s got it in him! Huge thanks to Austin, Aryanna, and Arissa Chappell for Sponsoring Laredo 'Larry' for the 2018/19 race season! ​This is one HARDY girl! When Comanche was a year and a half old, she suddenly became sick... The outcome was a fungal infection that nearly took her life. She fought hard and beat the illness. Unfortunately, it did not entirely end well, this girl lost her eye from the fungal attack... But since then, she has shown a strong resilience and has bounced back to be one of our best lead dogs! She takes commands like a champ and is known to drive the team through any open water with ease. Even if it means swimming! Look for Comanche leading team Tukaway this season and demonstrating how eyes are over rated when you have heart! Thanks to Don Mantey for continuing his sponsorship of Comanche for the 2018/19 Race Season! Meet Wallace! This young fella is the son of the GIANT Willie. Like his sister Arizona, he did not get Willie's gigantism, but he did get his drive to run! I actually see a lot of his grandfather Wizard in him, who is a now retired legend in this sport. Like Wizard, Wallace never stops moving. This dog is full of energy and has a huge love for food! Also like his sister, this will be his first training season, but he has the natural talent to potentially make the race team. He did lead some as a pup last winter! Huge thanks to The Hot Dog Guys from Pittsburgh, PA for sponsoring Wallace for the 2018/19 Race season! If your in Pittsburgh, find these guys, best hot dogs in town! This little girl is from the 'Maine Mountain' litter theme. And her name fits her due to her compact size. But Speck's full name is Ol' Speck and is known as one of the most challenging and biggest mountains in Maine. She has a fire in her to be the best and an ego to prove it, let's hope it doesn't all go to her head! This will be Speck's second season this year and will be fighting for a position in the main team! ​​Sponsor Speck for the 2018/19 Race Season! ​Kineo is from the 'Maine Mountain' litter theme. She is named after the mountain in the middle of Moosehead Lake in northern Maine. This mountain is a giant cliff faced slab of rhyolite rock extending high above the water. In the old days, it was a place where the natives gathered stone for making stone tools (I'm an archaeology dork.) 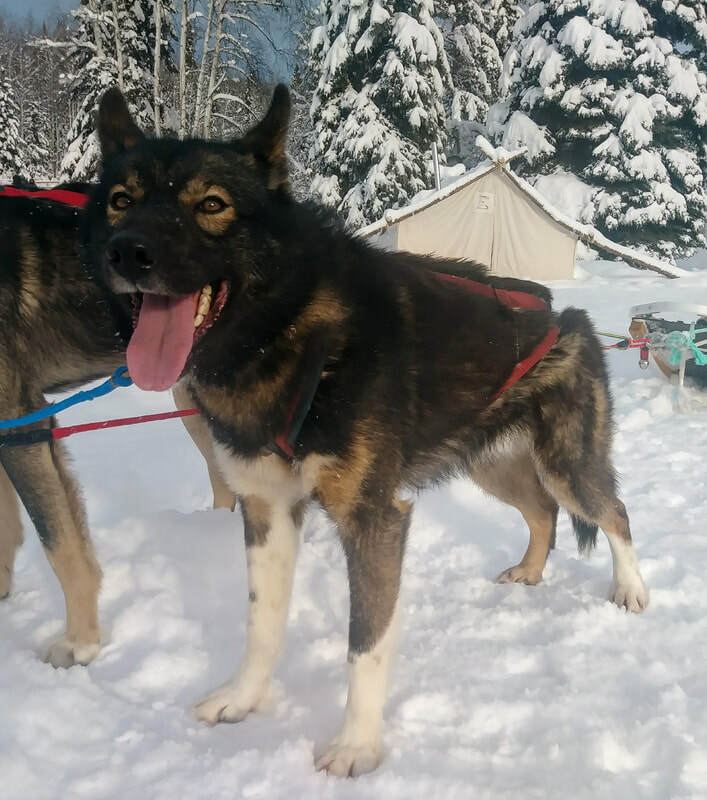 Kineo's behavior lives up to the rugged northern Maine mountain, but it is hard to describe this dog mostly because I am not sure she is a dog... For all of those Game of Thrones fans out there, this dog IS from 'north of the wall!' I have nicknamed her the 'creature' or 'Crazy Dog' depending on the day... When she settles down and stops wiggling she really is a sweetie. I can't wait to see how this little wildling companion proves herself for her second year this season. There is something special about this dog! Huge thanks to Linda Dindak and Linda Coleman from the Steel City for sponsoring Kineo for the 2018/19 race season! ​Ruckus is from our 'Wild Boys' litter theme. And he is exactly that, WILD! This little boy is full of energy. He is always ready to go forward. I expect big things out of this fella. He definitely has some leader potential. This will be Ruckus' second season. Last year he was a force on the team and often was found barking while running up any challenge. He certainly has the enthusiasm we look for as long as he can keep his focus! Huge thanks to Eric and Laura Fink for sponsoring Ruckus for the 2018/19 race season! ​Gidget is a single pup we acquired from our good friends over at Squid Acres Kennel. She is in fact cousins to our 'Jeep' Litter! Gidget is from the movie 'Secret Life of Pets' theme and is one heck of a fire cracker! this will be her second season and if there is any room for improvement I would be impressed. This girl was incredible last season and finished all of our races looking like a veteran. 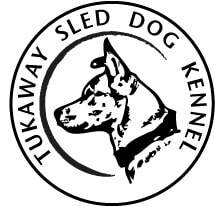 You will see Gidget leading at times this season for Team Tukaway! Huge Thanks to Hailey Otto, my best little buddy from Minnesota for sponsoring Gidget for the 2018/19 season! ​Arizona's father is the GIANT Willie in team Tukaway. She is not nearly as big as Willie, but she definitely has his abilities on the trail! This past winter, Arizona showed signs of being a lead dog and she wasn't even a year old! This season will be a development season for this sweetie. She will be training with the race team, but with no expectations. But if she continuous to prove to me she has what it takes, she could very well make it on the race team. Only time will tell! Huge thanks to James and Royanna Chappell for sponsoring Arizona for the 2018/19 race season! ​This natural talent and quirky spark plug in the team did fantastic last season! With an ever improving maturity level, I expect miss Fig to do big things this season! She has been showing many signs that it may be time to step up and help out at lead this season. With her beautiful gait and enthusiasm on the trail, we look forward to her taking a big part in this year's racing! Thanks to Kim Chandler for sponsoring Fig for the 2018/19 Race season! ​This will be Lucifer's first season with us, but I remember the day he was born three years ago at Lara-Ke Kennel. He was the last litter out of the 'great' Teva. Every pup Teva ever had has proven to at the least be a decent leader if not a great leader. This holds true with Lucifer! Expect to see this big boy charging up at lead this season with his half sister Sahara. So far in training, he has shown he is very forward oriented and loves to charge down the trail. 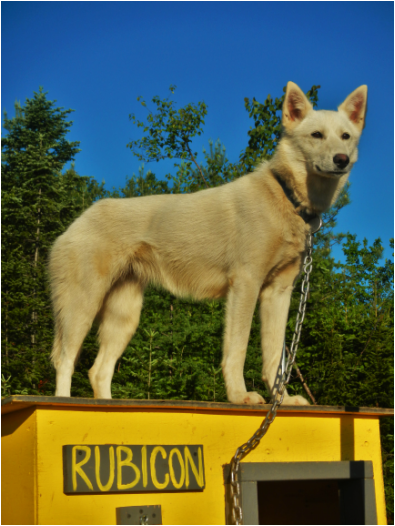 I think he will fit in well here this season and I fully expect him to make the Yukon Quest team!